Hi everypawdy! Meet our fellow kitty explorer, known as Olive the Adventurous! 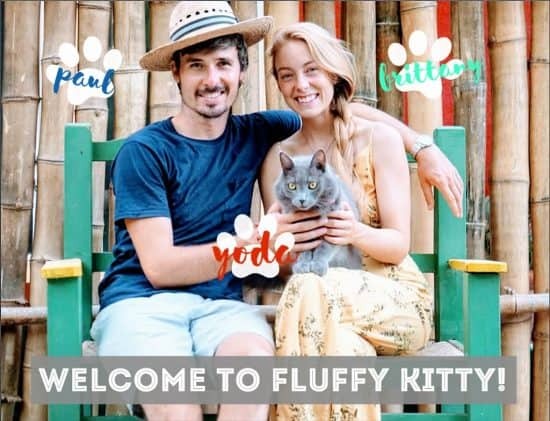 We’re happy to feature their story here in our Fluffy Kitty Commewnity. How did you and Olive meet? We adopted Olive from a wonderful animal shelter in Denver called Dumb Friends League. I was initially drawn to a black kitten, but another couple asked to meet that kitten first. While we were waiting, we decided to visit with a little ginger furball, and she was so friendly and cuddly that I had to take her home. When did you know you had an “adventure cat” on your hands? I saw some adventure cat accounts on Instagram and thought how cool it would be to have a cat that could experience hiking with me. I decided to harness train Olive just to see how she would react and was very surprised when she didn’t seem to mind it at all. From there I just brought her outside to adventure in our yard, and she really loved it. Did you train Olive as a kitten? What was that like? Then I took her outdoors and just let her explore where she wanted to go. She was timid at first but gained confidence with every experience outdoors. What made you want to explore with Olive? (Other than the fact that its pawsome). What was your first adventure together? We started off with a small hike close to where we live. Our neighborhood backs up to a beautiful park called Alderfer Three Sisters in Evergreen Colorado, so that was our first real venture into nature. Where are your favorite places to explore with Olive? As of now, we’ve been sticking to trails in or around Evergreen. We loved Windy Saddle trail and Mt. Falcon Park. Olive loves to explore, but she gets nervous in vehicles. We’re working on that before we take her on longer drives. Have you ever had a scary or challenging situation while traveling with Olive? On our last hike, Olive had her first experience with an off-leash dog that actually ran her up a tree. That was an unfortunate experience that shouldn’t have happened since we specifically explore at places where leash laws are in effect. It’s too bad that people don’t always follow the rules. What are your best tips for training Olive? Be patient. Cats tend to do things on their own terms. If your kitty is food driven, that can be a great benefit because you can offer treats when you put the harness on, introduce the leash, or place the kitty in the backpack. 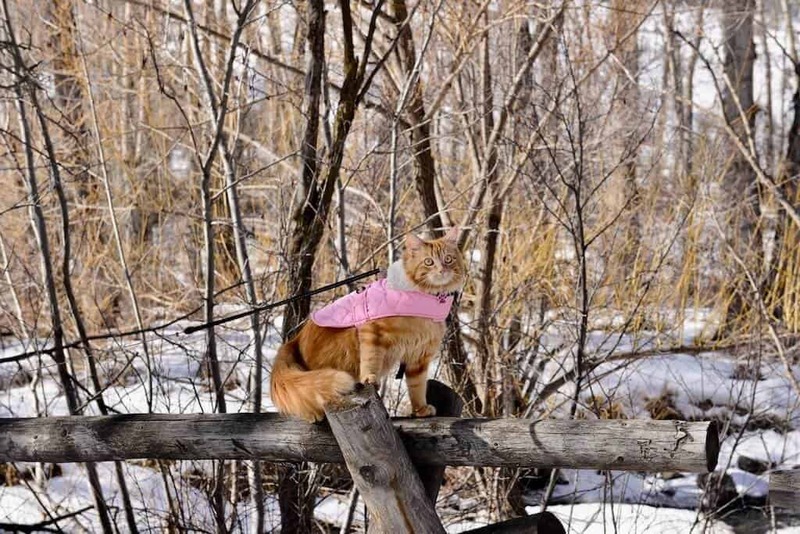 If your cat refuses to wear a harness, maybe try a different style. There are also many YouTube videos that you can watch to pick up great tips on how to train your cat. Have you ever traveled abroad with your feline? If so, which airline did you use? No air travel as of yet. What’s the farthest you’ve been with Olive? Not very far because she’s not a huge fan of car travel, but she’s definitely improving. 40 minutes from home is as far as we’ve gotten. Do you have a favorite cat café or a cat-friendly business that you know of? I’ve never been here, but Denver has a really cool cat cafe that I follow on Instagram called Denver Cat Company. You can have coffee and snacks while you play with the cats that are available for adoption. What’s your go-to travel gear for Olive? My top loading PetAmi backpack hands down. Olive can peek her head out and look around if she’s not wanting to walk. It’s roomy, and comfortable to wear too! Tell us about your dream adventure together, where would you and Olive go? I would love to take Olive on some backpacking adventures in the San Juan’s some day. Moab or Sedona would be really cool as well. Describe your best OR worst experience traveling with your kitty. What happened? I don’t really have a bad experience traveling with Olive. She’s just very curious and sometimes seems nervous. She meows quite a bit which she never does when we’re at home. I’ve been experimenting with CBD oil to help with her anxiety while in a vehicle, and I definitely think it helps. Do you have any last tips or advice for first-timers exploring with their cat? Make sure you have the option to put your cat in a backpack when they decide they’re done walking. Having treats and fresh drinking water available is a plus. Lastly, have fun and realize all trips outdoors won’t be the best. Sometimes Olive walks perfectly on a leash, and the next trip out she will refuse to walk the direction we need to go. In those cases, we just put her in the pack and she observes from there. You’ve really just got to go with the flow. Share with us 1-3 other travel cat accounts who inspire you! Follow Olive and us (@fluffyyoda) for more cat stories like this! Loved reading about little Olive, thanks for sharing.